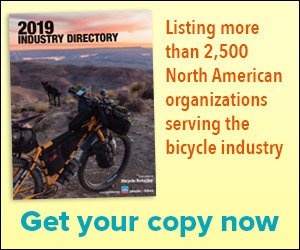 WASHINGTON, D.C. (BRAIN)—The League of American Bicyclists and the Alliance for Biking & Walking have unveiled a new, three-year campaign to double federal funding for bicycling and walking by 2013. The Advocacy Advance initiative is backed by renewed support from SRAM. EMERYVILLE, CA (BRAIN)—Participants in the Clif Bar 2 Mile Challenge avoided more than 43,000 car trips covering almost 385,000 miles during the program’s initial six-month team competition, ending November 1. BOULDER, CO (BRAIN)—Cannondale and Shimano have aligned with Fuji, Giant, Specialized and Trek to fund the Bikes Belong Grant Program by participating in the Employee Pro Purchase Program. SAN RAFAEL, CA (BRAIN)—The North Face has awarded a $2,500 grant to Trips for Kids Marin to help children and families explore the outdoors. MORGAN HILL, CA (BRAIN)—As part of its continuing effort to invest in the future of cycling through advocacy initiatives, Specialized Bicycle Components built on its partnership with IMBA and IMBA-affiliated clubs this year, helping support their 6th annual Take a Kid Mountain Biking Day. DENVER, CO (BRAIN)—Boa Technology, maker of the award-winning, patented Boa Lacing System, has launched the project ‘Reel Pink’, a national campaign aimed to raise awareness for breast cancer through the sale of limited edition pink Boa reels. SALT LAKE CITY, UT (BRAIN)—Bikes for Kids Utah annual fundraising dinner auction, held recently at Cucina Nassi, raised $30,000, its highest total ever and nearly $13,000 more than last year, in support of its cause to provide new bikes to underprivileged grade school children. CINCINNATI, OH (BRAIN)—The Outdoor Industries Women’s Coalition (OIWC) has added eight volunteers to its Board of Directors. The new Board members are: Larry Harrison, Lu Setnicka, Julia Clark Day, Michele Thomas, Heather Eusebio, Sara Lingafelter, Sarah Harper Burke and Amy Magyar. SAN FRANCISCO, CA (BRAIN)—Two years after launching at Interbike, Plus 3 Network has opened the first bridge to large groups of everyday folks through employee health and wellness programs. FRIEDRICHSHAFEN, Germany (BRAIN)—The SRAM Cycling Fund has donated €50,000 to Spanish Cycling Associations. CHAPEL HILL, NC (BRAIN)—Performance Bicycle has partnered with People for Bikes in a nationwide campaign to encourage public funding to improve bicycling infrastructure and make communities friendlier places to ride.